An emotional Louis Oosthuizen powered through after a stuttering start to win the South African Open by six shots. The 2010 Open champion dropped shots at the second and third holes to see his lead cut to just one shot, but he roared back in fine fashion to keep Romain Langasque at bay at Randpark Golf Club. 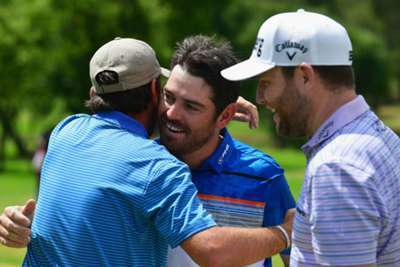 Oosthuizen finished with a four-under 67 for the second day in succession to secure his fifth European Tour victory on home soil and his first title since 2016. While Langasque had to settle for second despite carding a 66, he received a consolation in the shape of gaining one of the three qualifying spots available for the 2019 Open Championship, with the other two going to Charl Schwartzel and Oliver Wilson. After bogeying two of his first three holes, Oosthuizen responded with gains at four, six, seven and nine to reach the turn at 33 – one shot more than it took him in his opening-round 62. He was unable to replicate his stunning back nine from Thursday, but a tremendous approach set Oosthuizen up for an eagle on the par-five 14th and a six-shot lead that made him the sixth player to win the South African Open and The Open. "I knew today was either going to be very special or heartbreaking," said a tearful Oosthuizen. "I know there's only a few that have won The Open and the South African Open so I'm very chuffed to have my name on this. "It's been great, it's been phenomenal. We had a tough start today and we just bite the bullet and my caddie just told me, 'You're swinging it well, just go for it',"
"I just got back to basics, to try and hit fairways and greens. I know I'm putting well, I just needed to give myself putting opportunities for birdie. "This feels very special. This is perfect." Langasque produced his best round of the week to climb 18 places and beat Schwartzel to second by two shots, with the 2011 Masters winner having to settle for a share of third with Wilson, Bryce Easton and Thomas Aiken following a second straight one-over round. Brandon Stone, Haydn Porteous and Branden Grace finished in an eight-way share of seventh on nine under, while Kurt Kitayama, who won the Mauritius Open last weekend, was another shot back in a six-man tie for 15th that included Ernie Els.